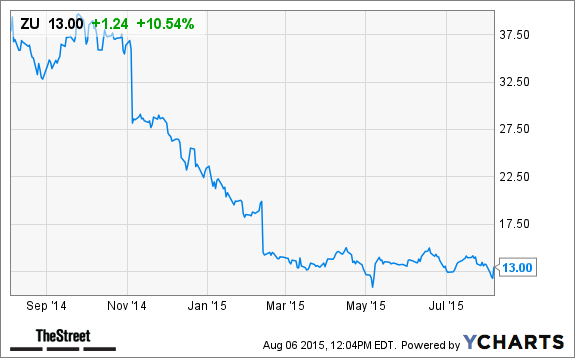 Zulily (ZU) stock is rising after the company reported better than expected 2015 second quarter earnings results. NEW YORK (TheStreet) -- Zulily (ZU stock is gaining by 11.31% to $13.09 on heavy trading volume on Thursday, after the company reported earnings results that surpassed analysts' estimates for the second quarter of 2015. The online retailer reported earnings of 6 cents per share on revenue of $297.56 million for the quarter ended June 28. Analysts surveyed by Thomson Reuters expected Zulily to report earnings of 4 cents per share on revenue of $294.32 million for the quarter. Orders placed increased by 7% year over year to 5.8 million for the second quarter, as active customers grew 19% to 4.9 million by the end of the quarter. "We've made good progress on our marketing strategy and we've materially improved our site experience, merchandising selection and order execution," CEO Darrell Cavens said in a statement. Last year, the company reported earnings of 9 cents per share on revenue of $285.01 million for the second quarter. "We rate ZULILY INC (ZU) a SELL. This is driven by a few notable weaknesses, which we believe should have a greater impact than any strengths, and could make it more difficult for investors to achieve positive results compared to most of the stocks we cover. The company's weaknesses can be seen in multiple areas, such as its generally disappointing historical performance in the stock itself, weak operating cash flow and poor profit margins."